The engines don't belong to me but to another British aeromodeller who posted on the Model Flying website. Having said that I got rid of five two strokes to a young man who has just joined the club. By that I mean that he is young compared to me, he's thirty-two, a father and a former Legionaire. I gave him a Merco 35 because I could not get it to run satisfactorily. I charged him 40€ (£35.25 Sterling or $46.36 US,) for a 25cc Super Tigre with a Super Quiet exhaust and let him have a K&B 65 Sportster and a Super Tigre 40 for two bottles of Beaujolais Villages. Sound engines but that's all they're worth these days! I actually received three bottles of Beaujolais Vilages because he was late in getting them to me. He probably couldn't afford the postage ei\ther. I'm sorry to hear about Peter Drake he was a great designer. How old was he I didn't think he was very old? Such a loss cancer does care what your age you are when it strikes. Location: Manor, TX But my heart is in Brooklyn N.Y.
Saturday and Sunday the temperature was in the 80's today.............. it's wet windy and cold in the forties or so. it will be like this till next week I'm stayin inside! That is sad news, indeed. My thoughts and prayers to his family. Supposed to be mid 60's, high was 48 today. SMH, so much for getting things done, it either rains or its too darn cold. First bit of winter for Eastern New Mexico, yesterday high was 41, dropped to 29 at night, today's high was 38. Rest of week will be gradually warming up to 62 and 40 at night by Friday. Location: Measnes, La Creuse, France. I feel sorry for you guys! Here in central France the daytime temperature is expected to be between 68F and 74F(20C-23C) with light winds and little rain right up to Sunday. Ideal flying and house painting weather! Mind you it's forecast to drop to to 41F (5C) tonight. Best get some logs in. 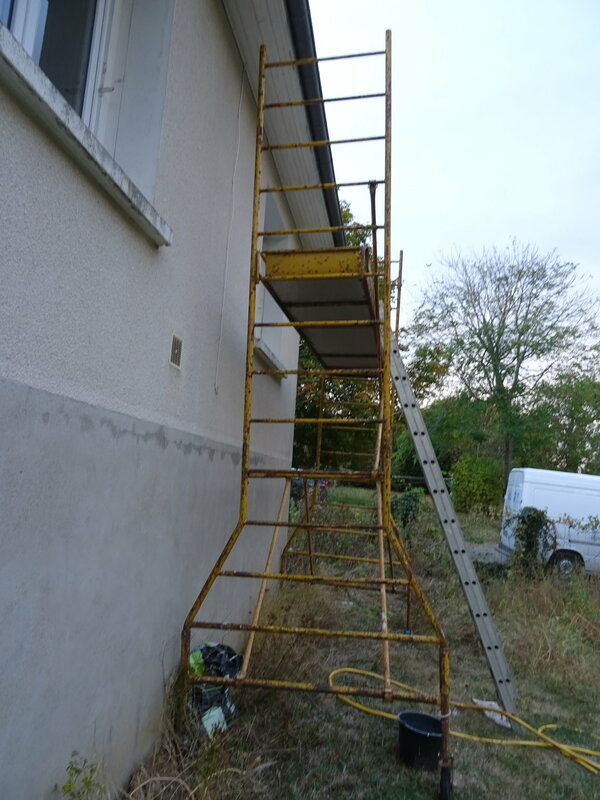 Meanwhile one of my model flying club colleagues has loaned me his scaffold tower which makes the job of painting the back of the house easier. Last edited by Telemaster Sales UK; 10-16-2018 at 09:40 PM. My fire logs are wet from this rain passing thru. I need to move a supply to the barn to dry for later use. I have a short supply ready to use by the house. First I have to get on the roof and clean the chimney before use. My runway way is overgrown again. Have to cut it when dry. I need to finish my current build before it goes over the 1 year mark of build time. First I have to catch up from my Florida trip. Turned into an eventful drive home 24 hours to get here. Glad to be in Texas again. And with cooler weather. Did you see much storm damage on the way home ET? 24 hours to get home? ....have you looked over your shoulder for the highway patrol? you could not have gotten a lot of sleep, 36 hours seems more true to form, of course I live further from Florida than you. How's this cool Texas weather treating you? The news is reporting a lot of flooding in low areas and the rain will be with us for a few more days. I generally do these trips in 16-17 hours since I travel with 2 small dogs. This trip was different. First there was heavy traffic northbound and southbound on the turnpike. Heavier than I have seen for a Sunday. Up by I-75 it slow downs to a crawl happened in about 5 places. So I get off by Lake City just short of I-10. Fuel up to cross the hurricane path and take some country roads before getting on I-10. I got on at Live Oak, FL. after checking the traffic flow west. Looked good, got on and about ¾ mile we come to a crawl. Now I’m worried about my high mileage clutch with all the stop and go driving. Slow driving about 10 miles then it speeds up but still heavy traffic. But that was not the bad part. Thirty mile from Tallahassee my trailer tire explodes. I come to a stop in the triangle safety zone of exit 225. Great! My spare was good to just get me to a tire shop and buy new tire. It was also Sunday probably had to wait until Monday. The bad part was that the tread of the blown tire had tightly wrapped itself around the axle and wedged against the hub. I just could not get it off with the short piece available to me to pull on. I decided to cut the tread part which would give me more tire to pull on. So with a hacksaw, a wire cutter and a lineman pliers I proceeded to cut the tread. Let me tell you, cutting the rubber and all those wires was not easy. But had to be done. In a way I was lucky on my breakdown location. With a call to the Florida Highway Patrol, I found that there was a nearby mobile tire repair service that would come to help so I agreed they come help me. As I worked cutting, a State Trooper stopped to check on me. In conversation I found out the tire service coming to me could bring and install tires at my location. So I called them and agreed to buy 2 tires, get rid of my lousy spare. By the time the repair service had gathered their equipment and tires, I had cut thru the tire, unwrapped it from the axle and hub and mounted my spare. So I met the repair service at a nearby truck stop. With tires changed, it was now starting to get dark. So I had them check my trailer lights. Problem #2, no trailer lights. I was facing spending the night at the truck stop. I drove to a clear area to check the trailer lights. The wiring looked good, I figured it had to be the plug connection, even though I had checked it. So I got some cleaning material and cleaned the plug. YES, I had lights. So I get back on I-10 and my GPS starts giving me a low voltage warning. I look at the truck volt meter and all looked good. It turned out to be the GPS connection. I started thinking what else could go wrong. Fortunately the rest of the trip was just a night drive. Lots of service vehicles going into Tallahassee. There was a caravan of service vehicles, Sheriff's vehicles and equipment going places. Police vehicles with lights flashing running service calls. Since it was dark by the time I crossed the area I could not see much. The area was darkened in places where I knew there were towns, or exits. A few rest stops and weigh stations were closed. I could see hundreds of trees that were down by the edge of the Highway. They were right up to the white line marking the edge of the highway. It almost looked like you could side swipe some trees if you got off center in the lane. Marianna, FL, a normal stop of mine had a few lights but mostly dark. After I passed this point traffic started to lighten up and lights started to reappear. I drove most of the night but stopped to rest when I got to Louisiana. Tiring drive. But here is the amazing thing. My worry about this trip was not trailer tires, they were low mileage. I replaced a few things on my truck for this trip. Even decided to change my high mileage fuel pump for this trip. It was still running good but I feared the high mileage. Not a job to be done by the side of the road. My big fear was my clutch. Although working good, I was hauling a trailer load of wooden fence material that was blown down by Hurricane Irma, I think. Original clutch on new truck from September 1995. Total mileage today 359,159. Amazing, it pulled this trailer like it was brand new. Sorry for this long post. Interesting trip. Not my worst trip. Donny it is really soggy here. Puddles all over the place. No report of flooding here. Looks like a week of rain here. Love this cool weather. No need to fret about the long post I enjoyed the whole thing! Sounds like you had quite the trip! Yes, the trip was interesting. I try to plan for emergencies but sometimes emergencies happen in areas not planned for. The saga continues at home. I use my 97 Jeep to pick up my large dog at the kennel. Too wet and cold to use the truck. Well before I left for Florida I found my old battery was causing problems. Yesterday I purchased a replacement battery. Today I tried to start it and the problem was not really the battery, although it needed replacement 4 years old not holding a good charge. The problem today is that the starter is weak and cannot turn the engine over. New starter on the horizon. Last 2 months I’ve had nothing but equipment failures. Lot of money spent on tires, batteries, belts, and fuel pump. Going broke fast. LOL. Just to keep on track with my airplane build, I did a little bit of sanding. May start covering tail feathers in the house at night. If I go into November it will be over a year build time. You seem to be living in a similar situation to us, ETpilot. Here, we have open wide stretches where one may be at least an hour away from the nearest civilization, not to mention a repair shop. There are stretches where there is no cellphone service. I've been replacing batteries before they definitely go, replacing hoses and belts every 4 or 5 years, tires promptly, alternators after 130k miles, etc. Even so, occasionally one of those "I gotcha" comes along, an unexpected breakdown, but have nipped most in the bud. Last gotcha was our 2013 SUV engine trouble light coming on, sometimes wouldn't start. Fancy messaging center and can't even say what is wrong. Put my code reader to it, says battery voltage low. After 4 years, the OEM battery was finally going bad. Replaced it, which cleared the code. Couldn't replace it with a premium higher capacity longer lasting battery because the factory battery box in the wheel well area won't fit another without extensive modifications, phooey. Seems you spend the rest of your life oiling it, changing it, repairing it, cleaning it, polishing it, painting it, etc., never ending cycle. I enjoyed reading your post also ETpilot. Sorry you had so many problems, I actually hate problems on the road. that's one of the reasons I haven't used my motorhome this year, until I make all the little repairs I've found. my son had to replace his starter this weekend also for the same reason. This crummy weather is working in my favor for now, I am putting in a lot of time in my shop. Yesterday I found the door to my shop unlatched and the rain soaked the entrance, I tried to get some work done but it was just too chilly and the A/C wasn't helping much, but today I've been working pretty good I put a small electric heater to blow at the door and it got comfortable enough, I'll be heading back up in a little while. I am anxious to complete A King Kobra for a friend it's in the way of my king Kobra build. The flooding is occuring mostly to the WEST of Austin and lake Travis is close to overflowing as is all the lakes on the Colorado, All the dams have flood gates open. LLano is catching flood hell. It's much nicer so far today but we face more rain later this week. Meanwhile I am whackin balsa. Your off to a good start being here, are you bending any balsa yet? How true! It has been that way for me for many years and still going on. I had a friend sketch a covering scheme for me. Not too sure how it will look but I’m going with it. Hope to start it tomorrow. It will be my 3rd iron on covering. Do not expect much. Lol. Donny, just saw the news on Lake Travis. Looks bad. Hope not much flooding occurs. Your area seems ok. Hope all is well. Just heavy rain in East Texas. No flooding but good puddles. Rain slowing down now. Looks like Sunday before my area clears. Good time to get my chimney cleaned. To of kids who bought their first houses this year. Whenever they complain about something breaking or needing updating or repaired I tell them welcome to home ownership. I have owned my house 35 years with it paid off for 5 years and I'm STILL working on it. Last weekend I replaced the flooring in the main bathroom. It still had the white 4" tile from 1964 now it has the gunstock wood look 6" X 24" tile. It was a lot of work and money but it sure looks good. I just pray it will be the last project! Tile companies have a racket going when it comes to tile. The floor tile was on close out so I got it for about $1.45 a square foot but the Bullnose (NOT on close out) was $6 each. Looking at the back and the sides the Bullnose is just a tile ripped down the center. They get 4+ times the money for one quick cut which I'm sure is done by an automated machine! I hate to be the bearer of bad news. But, there never is a last project! Always the next project! LOL. Sure there is its just the last project is a move to somewhere else. I've got my share of started but not completed projects, plus materials stocked for starting future projects, model planes, motorcycles, cars and house. Projects seem to not get completed, set aside for later and more projects appear to get done. Just the way it is. I have 2 projects that need to be done. As I get older I cannot handle this Texas summer heat. I need to build a sun/heat shield over my main concrete slab where I do most work. I also need a portable shield that I can tow about. I’ve been thinking about these projects for a few years now. . The towable shield would serve 3 ways, by the runway, firewood splitting area and mechanical repairs that may have to be done in the open. Just tow it as needed. I have the design in my head. Just have to get her done. Two projects on the get done list. True but I'm blowed if I'm painting the outside of the house again! In ten years time I will be eighty, that's if I'm still here at all, and even at seventy years of age I'm finding going up and down ladders and scaffold towers all day rather tiring! I found out last night that my house was built in 1979 and that in the intervening thirty-nine years it has never seen a lick of paint! No wonder the paint is falling off the south-west facing fascia boards! I have washed and rinsed all of the woodwork, I don't believe in painting over dirt, then I've rubbed it all down, applied primer to any bare wood, then a coat of white water-based undercoat, then a coat of flat matt white solvent-based paint followed by a coat of gloss. If the original paintwork lasted for thirty nine years I'm sure that lot will go the distance! I have tried to upload a picture of the progress so far but the site will not allow me to do so. This is not the first time on RC Universe either. Other projects include building a twenty meter long path so that a wheelchair using friend can come and visit me and of course, building the Big Guff over winter. Watch this space. Last edited by Telemaster Sales UK; 10-19-2018 at 04:10 AM.